KIEV, Ukraine -- Amid continued diplomatic strain with Russia, Ukraine announced plans Wednesday to significantly reduce the amount of gas it buys directly from its eastern neighbor -- and double what it takes from Europe. 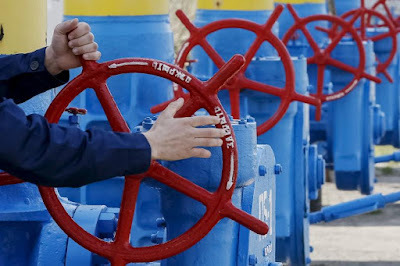 An employee turns a valve at a gas compressor station in the village of Boyarka, outside Kiev. Since November last year Kiev had refused to buy Russian gas because of the high price and instead relied on cheaper gas from Europe. Over the last year Ukraine doubled its gas imports from Europe to 10.3 billion cubic meters (bcm) and reduced imports from the Russian Federation from 14.5 bcm to 6.1 bcm, marking a historical minimum. Up until 2014, Ukraine exclusively imported all its gas from Russian under a contract with Moscow’s energy giant Gazprom, according to a report by Ukrainian news site Unian. Relying on a process known as reverse flow, Europe buys its gas from Russian and pumps it back into Ukraine. Normally this process would come at a premium, but in 2016 prices Russia is charging Ukraine $207 per 1,000 cubic meters of gas compared with Europe asking Kiev for around $175 for the same volume, despite it all coming from the same source. The difference in price is because Europe is buying far more gas from Russia than Ukraine and is able to negotiate a discount. Before the end of 2015, Russia had attempted to charge Ukraine $227 per 1,000 cubic meters, which is what prompted Kiev to stop buying. However, given the large amount the country needs, it will for have to continue to buy some of it supplies from Russia until Europe is able to account for all of its needs. Russia’s annexation of Crimea from Ukraine in March 2014 and its support for rebels in the Eastern Ukraine war had brought relations between the two neighboring countries to a low not seen since the end of the Cold War in 1991. While there is relative peace in the war torn regions of Donetsk and Luhansk, more than 9,100 people have been killed and left parts of Ukraine’s industrial regions in ruins. Ukraine still has no access to the territories under pro-Russian rebel control.